For the last couple of weeks, we’ve been looking at headphones in the under $300 range. This is the kind of price category where you really are looking for a step up in sound quality. When you listen to music on these headphones, you should definitely be able to tell the difference between these and a cheaper set. We wanted to take a look at a bunch of headphones, and find out which ones offer that increase in quality that you can expect in this price range. After researching a ton, and trying out every pair we could get our hands on, we think that the best pair of headphones you can buy for under $300 are the PSB M4U 1 High Performance Over-Ear Headphones. They’re just brilliant, and although they didn’t win by a landslide, we definitely thought that overall, they were the best pair. Before we start reviewing anything, we always like to survey customers, they tell us the kind of things they consider important in a product and the things they don’t. That way, we get an idea of what they want before we actually start reviewing anything. This means that we can review products with those kinds of things in mind, and better guide our customers to the products that suit them. Which of course, is the whole point. To find out what factors headphone buyers consider important, we surveyed a couple of groups of premium headphone buyers. These are people who are prepared to spend around the $300 mark (and sometimes quite a lot over) in order to get high quality headphones. We determined this final list by first finding all the headphones in our price range that fit the above criteria. Once we’d got the best ones, we knew we had to test them. So we ordered all those into the office. Then a big group of us sat down, and started testing them. The headphones that made it into our final 5 were all exceptional. At this kind of price range, there really is a very high standard, and the differences in quality between the 5 models on our list are very small. But these were definitely the best options. Sound quality is of course, the main reason that people choose to spend large sums of money on headphones. There’s a huge difference between listening to music through a pair of $10 earbuds, and hearing the same song through a set of dedicated high-end headphones. The difference is so dramatic that it can really blow you away the first time you hear it. You’ll hear sounds that you didn’t even know were there, and you’ll rediscover old songs that you thought you were bored of. Because you’ll realise you’ve only been listening to about half of the song. You just couldn’t hear the rest of it. So, when we were testing these headphones, our main priority was to recommend pairs that offer that kind of ‘WOW’ factor when you put them on and listen to a song for the first time. We did this by directly comparing the headphones. We would take one pair, listen to a track on them, and then do the same with the next. Our aim was to work out which headphones produced the best sound. Even if the difference was minuscule. We were looking for clarity of sound, detail, and a balance across the low, middle and high notes. We compared across a wide range of genres, listening to everything from Death Metal, to House. That way, we knew which headphones were only really good for a particular type of music, and which were genuinely well-rounded ones that you could use to listen to pretty much anything you like. We also used a bunch of different people to test. This is because different people obviously have different sound preferences, I might prefer headphones that emphasise the bass, while you might hate that. We wanted to get a good average and have a general consensus of which sets produced the best sound. Rather than just getting my opinion of what sounded best. All the headphones we recommend here have very high quality sound. No matter which you get you will notice a huge difference between these and cheaper alternatives. Plenty of headphones have all the great specs, and sound nice as well. But fall over when it comes to how they fit and how comfortable they are. It’s seemingly very easy to make a headset comfortable to wear. But it’s actually harder than you’d think. You’re not just designing headphones for one person. You have to think about your entire customer base. If you design big, loose headphones, then people with bigger heads will love them. They’ll declare them the most comfortable headphones in the world and urge everybody to get a pair! But when they do, all those people with smaller heads will be disappointed. No matter how much they tighten them, the headphones just won’t stay on their heads. They can’t go out in them, because they’ll fall off. Eventually they’ll stop using them, and maybe write you a bad review as well. Equally, if you design very tight headphones – people with smaller noggins will love them! They’ll grip their little heads nice and tight and be ever so comfortable for them. But people with large heads will find them too tight to get on. And if by some miracle they do manage to force them on, they’ll hurt too much to stay there for long. This is why designing well-fitting headphones for mass market is hard. Despite this, it’s also incredibly important that any set of headphones you buy does fit and is comfortable, because if they aren’t they’ll just end up in a draw somewhere. To test the comfort and fit of all these headphones, we had different members of our office team try them on. We also had them wear the headphones for extended periods of time, because while it’s not too hard to make headphones comfortable to wear initially. Making them comfortable for hours of continuous wear is much more challenging. All the headphones we recommend are comfortable, and fit well for the wide range of heads we tested them on. Sometimes you just want to disappear into your music and completely shut out the world. But you can’t do that if distracting background noises keep interrupting your listening. That’s why noise cancelling is important. Having a set of headphones that effectively block out sound means you can properly enjoy you music, or T.V. shows without having to turn the sound up itself. This is also a great feature if you fly a lot. Just put those headphones around your head, and the sound of that screaming child completely disappears. To test noise cancelling, you have one person put on the headphones, and then you play a distracting background noise. Like the sound of a foghorn or a Mariachi band. The louder we can turn up the background noise, without the person with the headphones on hearing it, the better the noise cancelling is. Every set of headphones we recommend here have decent noise cancellation, although some definitely do a better job than others. We’ll talk about that in our individual reviews. Headphones inevitably take some punishment when being used. Even if you’re extremely careful with your electronics, it’s almost a guarantee that at some point your headphones will end up squashed at the bottom of your bag. So they need to be able to survive a bit of rough treatment. To test the toughness of our headphones we paid particular attention to the build quality, we wanted to make sure that they weren’t liable to snap or the have the wires break. Once we were sure of that, we put a call in to some experienced headphone reviewers we know. We wanted to know about the reputation of the products we were recommending. Were they known for being reliable? Or did they have a tendency to stop working after a couple of months? We got rid of a few sets this way. But got good feedback on all the ones that made our top 5. If you’re spending this much money on a set of headphones, they’ve got to look good. You might be happy with decent performance but a silly aesthetic in the under $100 price range. But if you’re spending almost $300, then you want all-round quality. All the models we recommend here are cool looking headphones. However, they’re very different models. Some are kind of retro looking, while others have more of a futuristic vibe. So while they all look good, depending on your taste you’ll probably much prefer some to others. The overall best set of headphones we looked at, and the best model you can pick up for under $300, is the PSB M4U 1 High Performance Over-Ear Headphones. Listening to music on them is really something. We’re used to hearing manufacturers hype their headsets and come up with all kinds of marketing terms to describe some new ‘innovation’ they’ve made. Most of the time these innovations make no real difference to your listening experience at all. But with the M4U’s “Room Feel” feature. You really can tell the difference. According to PSB, the aim here is replicate the feeling and sound of having a band in the room with you. Rather than just hearing the sound through a set of speakers. I’m not one to give praise where it’s not warranted. But I have to say I think they’ve pulled it off brilliantly. The sound is just sensational, it’s unbelievably clear and the detail is astonishing. Listening to these vs a cheaper set of headphones really is just night and day. They also fit nicely, even on the wide range of heads that we tried them on. And they didn’t require us to squash our ears into the cups in order to fit them, which can sometimes be a problem for those with bigger ears. They do an excellent job of cancelling outside noises as well. We had great fun testing the noise cancelling, and found that we could play Mariachi music very loudly with the wearer completely unaware. Not the most scientific test, but a good one at that. The M4U also impressed us with its build quality and durability. This is something that’s easy for manufacturers to forget about, but PSB haven’t. They’ve managed to produce a tough and reliable set of headphones. So they’re great for taking out with you. In terms of style, we love them. Our pair was black with foldable arms and silver touches. Obviously, it’s down to personal preference, but we thought they were extremely good looking. They’re cool without being gaudy, which is always nice. All in all, we thought these were a sensational pair of headphones, and they were definitely the best set we looked at. We were also massively impressed with these Sennheiser headphones. The Momentums have brilliant sound quality. Definitely comparable to the PSBs although maybe not quite as good (so, so close though). They’re a very comfortable model and the squashy ear cushions really do hug your head. This is particularly nice if you sometimes find wearing headphones quite painful, as these are very soft. They also do a great job of cutting out background noise, which can be really handy if you live in a noisy neighbourhood, or don’t want to hear someone else’s music on public transport. While the Sennheisers have excellent durability, another nice feature is that they come with a hard carry-case. This might seem unnecessary, but can stop the headphones getting mangled, and prevent them from getting accidently damaged or trod on. We also liked how they looked, they’re a very different style to the PSB model, with big fluffy cushions, but they still look great. The SonicPros have fantastic sound quality, I personally listened to load of different tracks while wearing them, and the sound was just sensational. The noise cancellation is very impressive too. Perhaps not the strongest of all of these, but still excellent and much better than cheaper alternatives. They’re also absolutely lovely to wear, comfortably fitting the various head sizes of all our office members. What I really loved about this model in particular, was the way it looked. We got the ‘Gun-Metal Grey’ version, which comes with a gorgeous brown coloring for the ear cups and headband. This gave our pair a charming retro look, and apart from the fact that they’re a piece of high-end technology, they wouldn’t look out of place on an episode of Mad Men. Of all the headphones we’ve looked at, these are probably the closest to looking like a pair of ‘studio’ headphones. They’re black in color (but you can get white), and although they look good, were our least favorite purely in terms of aesthetic. They performed very well elsewhere though. Made with characteristic German efficiency, the Custom One has incredibly immersive sound, as well as decent noise reduction too. 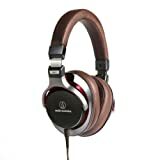 The build quality is clearly very solid and our headphone experts described Beyerdynamic as having an excellent reputation for producing long-lasting headsets. So they won’t be breaking on you for no reason. Last on our list, but still an excellent option, is the Beyerdynamic DT 990. The first thing that strikes you about this model, is the way it looks. The back of the ear cups are silver, the rest of the model is either a snowy white color, or black like the headband. Genuinely, they look like headphones you would wear in the Alps or something. It’s possible that not everyone will want headphones that look quite like that. But they are absolutely gorgeous. Beyerdynamic have produced a model with great sound quality too. Listening to music on them is very enjoyable, all the notes are clear and there’s a good balance between the different ranges that can sometimes be lacking. Noise cancellation is also impressive. These are a great all round set of headphones, and in case you can’t tell we think they’re very pretty. The under $300 price category of headphones is nice because there’s a lot of quality to choose from. However, this didn’t make it easy to pick a favorite. Just because there was so much competition. Overall, we thought the PSBs were the best. But competition was fierce and the standard was so high that you’d benefit from getting any one of them. If you’re into gaming, why not check out our guide on the best gaming headsets under $100. The Best Headphones under $300 are those with great sound quality, noise cancelling capabilities and durability. Are you after solid highs, lows, or mids?